International organisations began to express concern over the new piracy due to its high cost to global trade and the incentive to profiteer by insurance companies and others. The Somali government has been active in policing the area, though some believe that it wants to collaborate with the pirates as a bulwark against others and to disrupt global trade. An anti-piracy coalition known as Combined Task Force 150 established a Maritime Security Patrol Area in the Gulf of Aden, aided by the Indian Navy and Russian Navy. By 2010, these patrols were paying off, with a steady drop in the number of incidents. As of November 2017, there were no major vessels or hostages remaining in pirate captivity. In 2017, few piracy incidents were reported as the navies of Asian and European nations began to more actively rescue hijacked ships including the bulk carrier OS 35. In the early 1980s, prior to the outbreak of the civil war in Somalia, the Somali Ministry of Fisheries and the Coastal Development Agency (CDA) launched a development program focusing on the establishment of agricultural and fishery cooperatives for artisanal fishermen. It also received significant foreign investment funds for various fishery development projects, as the Somali fishing industry was considered to have a lot of potential owing to its unexploited marine stocks. The government at this time permitted foreign fishing through official licensing or joint venture agreements, forming two such partnerships in the Iraqi-Somali Siadco and Italian-Somali Somital ventures. 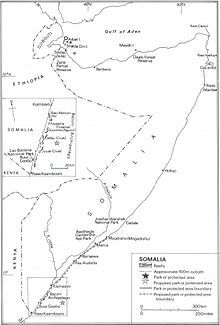 After the collapse of the central government in the ensuing civil war, the Somali Navy disbanded. With Somali territorial waters undefended, foreign fishing trawlers began illegally fishing on the Somali seaboard and ships began dumping industrial and other waste off the Somali coast. This led to erosion of the fish stock and local fishermen started to band together to try to protect their resources. An escalation began, leading to weapons being used and tactics such as taking over a foreign ship until their owners paid a ransom. After seeing the profitability of ransom payments, some financiers and former militiamen later began to fund pirate activities, splitting the profits evenly with the pirates. In most of the hijackings, the pirates have not harmed their prisoners. Combined Task Force 150, a multinational coalition task force, subsequently took on the role of fighting piracy off the coast of Somalia by establishing a Maritime Security Patrol Area (MSPA) within the Gulf of Aden. However, many foreign naval vessels chasing pirates were forced to break off when the pirates entered Somali territorial waters. To address this, in June 2008, following a letter from the Somali Transitional Federal Government (TFG) to the President of the UN Security Council requesting assistance for the TFG's efforts to tackle acts of piracy off the coast of Somalia, the UN Security Council unanimously passed a declaration authorizing nations that have the consent of the Transitional Federal Government to enter Somali territorial waters to deal with pirates. On the advice of lawyers, the Royal Navy and other international naval forces have often released suspected pirates that they have captured because, although the men are frequently armed, they have not been caught engaging in acts of piracy and have thus not technically committed a crime. On 8 April 2009, four Somali pirates seized MV Maersk Alabama 240 nautical miles (440 km; 280 mi) southeast of the Somalia port city of Eyl. The ship was carrying 17,000 metric tons of cargo, of which 5,000 metric tons were relief supplies bound for Somalia, Uganda, and Kenya. On 12 April 2009, U.S. Navy SEAL snipers killed the three pirates that were holding Captain Richard Phillips hostage aboard a lifeboat from Maersk Alabama after determining that Captain Phillips' life was in immediate danger. A fourth pirate, Abdul Wali Muse, surrendered and was taken into custody. On 18 May, a federal grand jury in New York returned a 10-count indictment against him. On 20 April 2009, United States Secretary of State Hillary Clinton commented on the capture and release of seven Somali pirates by Dutch Naval forces who were on a NATO mission. After an attack on Handytankers Magic, a petroleum tanker, the Dutch frigate De Zeven Provinciën tracked the pirates back to a pirate "mother ship" and captured them. They confiscated the pirates' weapons and freed 20 Yemeni fishermen whom the pirates had kidnapped and who had been forced to sail the pirate "mother ship". Since the Dutch Naval Forces were part of a NATO exercise, but not on an EU mission, they lacked legal jurisdiction to keep the pirates so they released them. Clinton stated that this action "sends the wrong signal" and that additional coordination was needed among nations. On 2 May 2009, Somali pirates captured MV Ariana with its 24 Ukrainian crew. The ship was released on 10 December 2009 after a ransom of almost US$3,000,000 was paid. On 11 May 2010 Somali pirates seized a Bulgarian-flagged ship in the Gulf of Aden. Panega, with 15 Bulgarian crew members aboard, was en route from the Red Sea to India or Pakistan. This was the first such hijacking of a Bulgarian-flagged ship. On 12 May 2010, Athens announced that Somali pirates had seized a Greek vessel in the Gulf of Aden with at least 24 people on board, including two Greek citizens and some Filipinos. The vessel, sailing under the Liberian flag, was transporting iron from Ukraine to China. On 15 January 2011 13 Somali pirates seized Samho Jewelry, a Maltese-flagged chemical carrier operated by Samho Shipping, 650 km southeast of Muscat. The Republic of Korea Navy destroyer Choi Young shadowed Samho Jewelry for several days. In the early morning of 21 January 2011, 25 ROK Navy SEALs on small boats launched from Choi Young boarded Samho Jewelry while Choi Young's Westland Super Lynx provided covering fire. Eight pirates were killed and five captured in the operation; the crew of 21 was freed with the captain suffering a gunshot wound to the stomach. The captain fully recovered later. On 28 January 2011, an Indian Coast Guard aircraft while responding to a distress call from CMA CGM Verdi, located two skiffs attempting a piracy attack near Lakshadweep. Seeing the aircraft, the skiffs immediately aborted their piracy attempt and dashed towards the mother vessel, MV Prantalay 14 – a hijacked Thai trawler, which hurriedly hoisted the two skiffs on board and moved westward. The Indian Navy deployed INS Cankarso which located and engaged the mothership 100 nautical miles (190 km) north of the Minicoy island. Ten pirates were killed while 15 were apprehended and 20 Thai and Burmese fishermen being held aboard the ship as hostages were rescued. Within a week of its previous success, the Indian Navy captured another hijacked Thai trawler, MV Prantalay 11 and captured 28 pirates aboard in an operation undertaken by INS Tir pursuant to receiving information that a Greek merchant ship had been attacked by pirates on board high-speed boats, although it had managed to avoid capture. When INS Tir ordered the pirate ship to stop and be boarded for inspection, it was fired upon. INS Tir returned fire in which three pirates were injured and caused the pirates to raise a white flag indicating their surrender. INS Tir subsequently was joined by CGS Samar of the Indian Coast Guard. Officials from the Indian Navy reported that a total of 52 men were apprehended, but of that 24 are believed to be Thai fishermen who were hostages of the 28 African pirates. In late February 2011, piracy targeting smaller yachts and collecting ransom made headlines when four Americans were killed aboard their vessel, Quest, by their captors, while a military ship shadowed them. A federal court in Norfolk, Virginia, sentenced three members of the gang that seized the yacht to life imprisonment. On 24 February 2011 a Danish family on a yacht were captured by pirates. In March 2011, the Indian Navy intercepted a pirate mother vessel 600 nautical miles (1,100 km) west of the Indian coast in the Arabian Sea on Monday and rescued 13 hostages. Sixty-one pirates were also caught in the operation carried out by Navy's INS Kalpeni. On 5 January 2012, an MH-60S Seahawk from the guided-missile destroyer USS Kidd, part of the USS John C. Stennis Carrier Strike Group, detected a suspected pirate skiff alongside the Iranian-flagged fishing boat, Al Molai. The master of Al Molai sent a distress call about the same time reporting pirates were holding him captive. A visit, board, search and seizure team from Kidd boarded the dhow, a traditional Arabian sailing vessel, and detained 15 suspected pirates who had been holding a 13-member Iranian crew hostage for several weeks. Al Molai had been hijacked and used as a mothership for pirate operations throughout the Persian Gulf, members of the Iranian vessel's crew reported. The tanker Aris 13, which had been carrying fuel from Djibouti to Mogadishu, was hijacked off the coast of Somalia on 13 March 2017. This was the first reported hijacking of a large commercial vessel in five years. Two skiffs approached the tanker and boarded the vessel off the northern coast of Somalia. Eight Sri Lankan crew members were aboard at the time. After being captured, Aris 13 was taken to Alula and anchored there before its release without ransom was confirmed by security officials on 16 March 2017. Most of the pirates are young. An official list issued in 2010 by the Somali government of 40 apprehended pirate suspects noted that 80% (32/40) were born in Somalia's southern conflict zones, while only 20% (8/40) came from the more stable northern regions. As of 2012, the pirates primarily operated from the Galmudug region in the central section of the country. In previous years, they largely ventured to sea from ports located in the northeastern province of Puntland until the regional administration launched a major anti-piracy campaign and operation and established a maritime police force (PMPF). The pirates get most of their weapons from Yemen, but a significant number come from Mogadishu, Somalia's capital. Weapons dealers in the capital receive a deposit from a hawala dealer on behalf of the pirates and the weapons are then driven to Puntland where the pirates pay the balance. 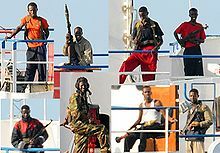 Various photographs of pirates in situ indicate that their weapons are predominantly AK47, Type 56, AKM, RPK, PK, RPG-7, and TT33. Additionally, given the particular origin of their weaponry, they are likely to have hand grenades such as the RGD-5 or F1. A 2010 report suggested that piracy off the coast of Somalia led to a decrease of revenue for Egypt as fewer ships use the Suez canal (estimated loss of about $642 million), impeded trade with neighboring countries, and negatively impacted tourism and fishing in the Seychelles. According to Sky News, around 50% of the world's containers passed through the Horn of Africa coastline as of 2012. The European Union Naval Force (EU NAVFOR) has a yearly budget of over 8 million Euros earmarked for patrolling the 8.3 million square kilometres (3,200,000 square miles). These issues have generally not been reported in international media when reporting on piracy. According to Muammar al-Gaddafi, "It is a response to greedy Western nations, who invade and exploit Somalia's water resources illegally. It is not a piracy, it is self-defence." Following the Indian Ocean tsunami of December 2004, allegations have emerged that after the outbreak of the Somali Civil War in late 1991, Somalia's long, remote shoreline was used as a dump site for the disposal of toxic waste. The huge waves which battered northern Somalia after the tsunami are believed to have stirred up tonnes of nuclear and toxic waste that was illegally dumped in Somali waters by several European firms – front companies created by the Italian mafia. The European Green Party followed up these revelations by presenting before the press and the European Parliament in Strasbourg copies of contracts signed by two European companies—the Italian Swiss firm, Achair Partners, and an Italian waste broker, Progresso—and representatives of the warlords then in power, to accept 10 million tonnes of toxic waste in exchange for $80 million (then about £60 million). According to a report by the United Nations Environment Programme (UNEP) assessment mission, there are far higher than normal cases of respiratory infections, mouth ulcers and bleeding, abdominal hemorrhages and unusual skin infections among many inhabitants of the areas around the northeastern towns of Hobbio and Benadir on the Indian Ocean coast. UNEP continues that the current situation along the Somali coastline poses a very serious environmental hazard not only in Somalia but also in the eastern Africa sub-region. On 1 April 2010, USS Nicholas was on patrol off the Somali coast when it took fire from men in a small skiff. After chasing down the skiff and its mothership, US military captured five Somalis. Judge Raymond A. Jackson, a Federal District Court judge in Norfolk, Virginia threw out the piracy charge, which dates from enactment in 1819 when piracy was defined only as robbery at sea. The penalty for piracy is mandatory life in prison. The U.S. government appealed the ruling. In March 2011 the five Somalis were sentenced to life for piracy to run consecutively with the 80-year term. In the same month 13 Somalis and one Yemeni suspected of hijacking and killing four Americans aboard a yacht made their first appearance in federal court in Norfolk. On 28 January 2011, pursuant to the naval engagement of the pirate mother vessel MV Prantalay (a hijacked Thai trawler) by INS Cankarso, the Indian Navy and the Indian Coast Guard killed 10 pirates and apprehended 15, while rescuing 20 Thai and Burmese fishermen that were held aboard the ship as hostages. The rescued fishermen were sent to Kochi while the 15 pirates, of Somali, Ethiopian and Kenyan origin, were taken to Mumbai. The Mumbai Police confirmed that they registered a case against the pirates for attempt to murder and various other provisions under the Indian Penal Code and the Passports Act for entering the Indian waters without permission. In March 2017, it was reported that pirates had seized an oil tanker that had set sail from Djibouti and was headed to Mogadishu. This was alleged to be the first "successful" hijacking of a large vessel since 2012. While initially the pirate crew demanded a ransom, the ship and its crew were released with no ransom given after the crew learned that the ship had been hired by Somali businessmen. ^ "Chinese Navy Hands Pirates Over to Somali Authorities". Maritime executive. 8 May 2017. Retrieved 22 October 2018. ^ "Marine Fisheries Review, Somali fishery industry has potential for growth, December 1982, 44 (12)" (PDF). Retrieved 27 March 2011. ^ a b "The Advantage of Piracy". German-foreign-policy.com. Retrieved 17 December 2011. ^ Washington, The (11 April 2009). "Somali pirates a far cry from buccaneers of old". Washingtontimes.com. Retrieved 17 December 2011. ^ Najad Abdullahi (11 October 2008). ""'Toxic waste' behind Somali piracy", October 2008". English.aljazeera.net. Retrieved 27 March 2011. ^ Westcott, Kathryn (23 April 2008). "Somalia's pirates face battles at sea". BBC News. Retrieved 2 May 2008. ^ Commander, Combined Maritime Forces Public Affairs (29 September 2008). "Combined Task Force 150 Thwarts Criminal Activities". US Africa Command. Archived from the original on 6 December 2008. Retrieved 17 November 2008. ^ Starr, Barbara (29 October 2007). "U.S. destroyer pursuing hijacked ship in Somali waters, military says". CNN. Retrieved 22 May 2010. ^ Rankin, Nick (11 March 2008). "No vessel is safe from modern pirates". BBC News. Retrieved 26 March 2010. ^ a b Jay Bahadur (31 January 2012). "Somalia Pirates Adopt Troubling New Tactics". The Daily Beast. Retrieved 20 February 2012. ^ Hassan, Abdiqani (23 April 2008). "Crew say lucky to be alive after Somali hijack". Reuters Africa. Retrieved 25 April 2008. ^ a b Alaric Nightingale, Michelle Wiese Bockmann (22 October 2012). "Somalia Piracy Falls to Six-Year Low as Guards Defend Ships". Bloomberg News. Retrieved 25 October 2012. ^ "Somalia: International Piracy Attacks Reach Five-Year Low in 2012". Sabahi. 17 January 2013. Retrieved 21 January 2013. ^ a b "Pirates Hijack Two Tankers Within 24 Hours Off Somali Shore". FoxNews.com. 26 March 2009. Retrieved 26 March 2009. ^ "pr-canada.net". Pr-Canada.Net. Retrieved 27 March 2011. 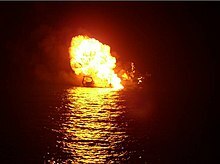 ^ "India: Pirate 'mother ship' left in flames". CNN. 19 November 2008. Retrieved 19 November 2008. ^ Miriri, Duncan (14 November 2007). "Somali pirates killed Chinese sailor-official". Reuters. Retrieved 12 April 2009. ^ United Nations Security Council Resolution 1838. (2008) S/RES/1838 (2008) 7 October 2008. Retrieved 19 November 2008. ^ "New Somalia piracy resolution adopted at UN". Google News. Agence France-Presse. 8 October 2008. Archived from the original on 1 December 2008. Retrieved 10 October 2008. ^ "India calls for UN force to deter pirates off Somalia". The Times of India. 13 November 2008. Retrieved 27 March 2009. ^ "Chinese fishing boat reported hijacked off Kenya". International Herald Tribune. Associated Press. 14 November 2008. Archived from the original on 13 February 2009. Retrieved 17 November 2008. ^ "IDSS S&S FPP.indd" (PDF). Archived from the original (PDF) on 26 July 2011. Retrieved 27 March 2011. ^ "India 'sinks Somali pirate ship'". BBC News. 19 November 2008. ^ "India 'Indian navy 'sank Thai trawler". BBC News. 25 November 2008. ^ "India navy defends piracy sinking". BBC News. 26 November 2008. ^ Pandey, Geeta (21 November 2008). "India navy 'to go after pirates'". BBC. Retrieved 21 November 2008. ^ Sanders, Edmund; Barnes, Julian E. (9 April 2009). "Somalia pirates hold U.S. captain". Los Angeles Times. Retrieved 12 April 2009. ^ "Somali pirates hijack Danish ship". BBC news. 8 April 2009. Retrieved 8 April 2009. ^ "Ship carrying 20 Americans believed hijacked off Somalia". CNN. 9 April 2009. Retrieved 9 April 2009. ^ "Official: US sea captain faced imminent danger". Associated Press. 12 April 2009. Archived from the original on 14 April 2009. Retrieved 12 April 2009. ^ Mikkelsen, Randall (12 April 2009). "US acted after pirates aimed at ship captain". Reuters. Archived from the original on 14 April 2009. Retrieved 12 April 2009. ^ "US captain rescued from pirates". BBC News. 13 April 2009. Retrieved 13 April 2009. ^ Verjee, Zain; Starr, Barbara (12 April 2001). "Captain jumps overboard, SEALs shoot pirates, official says". CNN. Retrieved 12 April 2009. ^ "US captain held by pirates freed". BBC News. 12 April 2009. Retrieved 14 April 2009. ^ "Indictment (U.S. v. Abduwali Abdukhadir Muse)". FindLaw. 19 May 2009. Retrieved 19 May 2009. ^ a b c d e Elise Labott (20 April 2009). "Clinton says releasing pirates sends 'wrong signal'". CNN. Retrieved 21 April 2009. ^ a b Mohamed Ahmed (18 April 2009). "NATO frees pirate hostages, Belgian ship seized". Reuters. Retrieved 21 April 2009. ^ a b c d e Constant Brand (23 April 2009). "Donors Pledge Over $250 Million for Somalia". CNN. Archived from the original on 28 June 2011. Retrieved 23 April 2009. ^ a b c d e "Donors pledge over $250 million for Somalia". USA Today. 23 April 2009. Retrieved 23 April 2009. ^ "No dejo de pensar en la ni Niña de 12 años que vi cuando me llevaron a otro barco y en la cocinera violada por los piratas". El Mundo, (in Spanish). 22 November 2009. ^ "Somali pirates free Greek ship with Ukrainian crew". BBC News Online. 10 December 2009. Retrieved 12 December 2009. ^ a b "Pirates Step Up Threats Against British Couple, Threaten to 'Punish' Them". Fox News. 8 November 2009. Retrieved 8 November 2009. ^ "Somali pirate gang who held Chandlers have families in Britain.... and one kidnapper's wife is an asylum seeker". Mail Online. 26 November 2010. ^ "BBC News: Somali pirates free UK couple Paul and Rachel Chandler". Bbc.co.uk. 14 November 2010. Retrieved 27 March 2011. ^ "Harpers Magazine, Pirates and the CIA: What would Thomas Jefferson have done? by Ken Silverstein, 9 April 2009, but modified on 12 April". Harpers.org. Retrieved 27 March 2011. ^ Mansur Mirovalev (11 May 2010). "Russia says freed pirates didn't reach land". BusinessWeek. ^ Michael Richards (14 January 2011). "Smarter Somali pirates thwarting navies, NATO admits". AFP. Archived from the original on 22 January 2011. Retrieved 23 January 2011. ^ a b "Various News Reports, collected on Google News". Google News. Retrieved 4 January 2011. ^ "BBC News: Indian navy seizes pirates' Indian Ocean mothership". Retrieved 4 January 2011. ^ the CNN Wire Staff (22 February 2011). "Americans slain by captors on hijacked yacht; pirates killed, arrested". www.cnn.com. Retrieved 22 February 2011. ^ "Somali pirate gets life in jail". BBC. 3 October 2011. Retrieved 3 October 2011. ^ "Pirater truer med at dræbe gidsler – dr.dk/Nyheder/Udland". Dr.dk. Retrieved 27 March 2011. ^ "Navy intercepts pirate ship, rescues 13 sailors". Retrieved 14 March 2011. ^ "Indian navy captures 16 Somali pirates on Iranian ship". BBC News. 28 March 2011. ^ "Pirate Capture Shows U.S. Commitment to Free Seas, Leaders Say". American Forces Press Service. 7 January 2012. ^ a b Kriel R, Duggan B (24 November 2015). "Somali pirates seize Iranian, Thai ships". CNN. Retrieved 11 January 2016. ^ "Somali pirates release oil tanker and crew members without ransom, officials say". Retrieved 17 March 2017. ^ "Somali pirates release oil tanker and crew without ransom". The Telegraph. 16 March 2017. ISSN 0307-1235. Retrieved 23 May 2018. ^ "Pirates hijack oil tanker off Somalia's coast in 1st reported piracy in 5 years". CBC News. The Associated Press. 14 March 2017. ^ "SomaliaReport: Why Pirates Fight Each Other". Archived from the original on 11 June 2016. Retrieved 20 May 2016. ^ Macruf, Harun (23 July 2010). "Magacyada Maxaabiis Soomaali ah oo ku xiran Seychelles". VOA. Retrieved 3 October 2012. ^ a b "SomaliaReport: Puntland Marine Police Force Enter Eyl". Archived from the original on 24 March 2016. Retrieved 20 May 2016. ^ a b c Hunter, Robyn (28 October 2008). "Somali pirates living the high life". BBC. Retrieved 20 November 2008. ^ Bahadur, Jay (24 May 2011). "Somali pirate: 'We're not murderers... we just attack ships'". London: The Guardian (UK). ^ a b Consortium of International Organizations (August 2011). Best Management Practices for Protection against Somalia Based Piracy (PDF). Livingston: Witherby Seamanship International, London. ISBN 978-1-85609-505-1. ^ a b "Inside The EU's Anti-Piracy Nerve Centre". Sky News. 23 February 2012. Archived from the original on 29 April 2012. ^ "Somali pirates killed 'legally'". BBC News. 19 December 2008. Retrieved 27 March 2009. ^ Pflanz, Mike (14 January 2009). "Cargo ship escapes Somali pirates". London: Telegraph. Retrieved 27 March 2009. ^ Bruce Sterling (3 December 2009). "The Pirate Stock Exchange". Beyond the 14 Beyond. Wired. Retrieved 19 January 2010. ^ David Gardner (12 January 2009). "Five Somali pirates drown as they squabble over their $3million ransom". London: Dailymail.co.uk. Retrieved 27 March 2009. ^ "Pirates 'gained $150m this year'". BBC News. 21 November 2008. Retrieved 27 March 2009. ^ "Shabaab-Somali pirate links growing: UN adviser". Reuters. 20 October 2011. ^ Reuters Editorial (6 July 2011). "Piracy ransom cash ends up with Somali militants". Reuters. Retrieved 20 May 2016. ^ "Al Qaeda Urges Somalis To Attack Ships". CBS. 16 April 2009. Archived from the original on 12 February 2011. ^ Vespe, Michele; Greidanus, Harm; Alvarez, Marlene Alvarez (1 September 2015). "The declining impact of piracy on maritime transport in the Indian Ocean: Statistical analysis of 5-year vessel tracking data". Marine Policy. 59: 9–15. doi:10.1016/j.marpol.2015.04.018. ^ a b c d e Venetia Archer, Robert Young Pelton. "Can We Ever Assess the True Cost of Piracy?". Somalia Report. Archived from the original on 2 June 2012. Retrieved 21 May 2012. ^ a b Mcknight, Terry; Michael Hirsh (2012). Pirate Alley: Commanding Task Force 151 Off Somalia. Annapolis: Naval Institute Press. p. 42. ^ Utler, Simone (25 January 2011). "Alleine unter Piraten" (in German). Spiegel Online. Retrieved 25 January 2011. ^ a b c Gill, Sharon (20 January 2011). "Maritime Piracy Costs Global Community 12 Billion a Year". Archived from the original on 24 January 2011. Retrieved 27 January 2011. ^ "Piracy ransom cash ends up with Somali militants". Reuters. 6 July 2011. ^ a b Anna, Bowden. "The Economic Cost of Somali Piracy 2011" (PDF). Oceans Beyond Piracy. ^ Hopkins, Nick (8 May 2012). "Outgunned Somali pirates can hardly believe their luck". The Guardian. London. ^ "Private navy planned to counter pirate raids". The National. ^ Owen, Jonathan (17 April 2011). "The Economics of Piracy". Geopolicity. London: The Independent. ^ Young Pelton, Robert. "Plunder, Politics, Presumption and Puntland". Somalia Report. Archived from the original on 17 January 2012. Retrieved 31 May 2012. ^ "Kenyan Fishermen Celebrate Somali Pirates" (PDF). A24Media. Archived from the original (PDF) on 25 October 2010. ^ Georges Pernoud (21 May 2010). Dans les îles Eparses (in French). Thalassa (television). Event occurs at 51'48", 1:00:17. Retrieved 23 May 2010. ^ Ocean Beyond Piracy (2 June 2011). "Human Cost of Somali Piracy" (PDF). Archived from the original (PDF) on 26 September 2011. Retrieved 7 July 2011. ^ a b Jonathan Saul (20 June 2011). "Deaths of Seafarers in Somali Pirate Attacks Soar". Reuters. Retrieved 7 July 2011. ^ a b "Shooting to Kill Pirates Risks Blackwater Moment". Retrieved 20 May 2016. ^ "Torture by Somali pirates detailed at Va. trial". Associated Press. 20 April 2012. ^ a b c "UN envoy decries waste dumping off Somalia". Middle-east-online.com. 26 July 2008. Retrieved 27 March 2011. ^ a b c d e Abdullahi, Najad (11 October 2008). "Toxic waste' behind Somali piracy'". English.aljazeera.net. Retrieved 27 March 2009. ^ Dagne, Ted (4 February 2010). "Somalia: Current Conditions and Prospects for a Lasting Peace" (PDF). Defense Technical Information Center. Congressional Research Service. pp. 13, 27. Retrieved 13 September 2010. illegal fishing and toxic waste dumping that has been ignored by foreign governments. ^ "Johann Hari: You Are Being Lied to About Pirates". Huffingtonpost.com. 13 April 2009. Retrieved 27 March 2011. ^ a b Clayton, Jonathan (4 March 2005). "Somalia's secret dumps of toxic waste washed ashore by tsunami". London: Timesonline.co.uk. Retrieved 25 February 2009. ^ It is estimated[by whom?] that it costs around $2.50 per ton to illegally dump toxic waste in Somali waters as opposed to $250 per ton for legal disposal in Europe. ^ "You are being lied to about pirates". The Independent. London. 5 January 2009. Retrieved 10 April 2009. ^ "RFI – US vessel evades capture but pirates take more". Rfi.fr. Retrieved 27 March 2011. ^ "United Nations Convention on the Law of the Sea, 10 December 1982" (PDF). Retrieved 27 March 2011. ^ Policante, Amedeo (2013). "The new pirate wars: the world market as imperial formation". Global Discourse. 3: 52–71. doi:10.1080/23269995.2013.804760. ^ "China has no military ambition in Djibouti – Global Times". www.globaltimes.cn. Retrieved 30 November 2015. ^ Commander, Combined Maritime Forces Public Affairs. "New Counter-Piracy Task Force Established". Navy.mil. Retrieved 27 March 2011. ^ "Shared Awareness and Deconfliction (SHADE)". Eunavfor.eu. Archived from the original on 21 February 2011. Retrieved 27 March 2011. ^ "Somalia: Puntland Government Continues Anti-Piracy Campaign, Rejects Monitoring Group Accusations". Puntland-gov.net. Archived from the original on 24 July 2011. Retrieved 27 March 2011. ^ "Somalia: Puntland to start construction of new Navy base". Horseedmedia.net. Retrieved 27 March 2011. ^ a b "Pirate on US wanted list arrested in Somalia". Abcnews.go.com. 20 May 2010. Retrieved 27 March 2011. ^ "Puntland president delineates government achievement". Garoweonline.com. 9 January 2010. Archived from the original on 14 May 2011. Retrieved 27 March 2011. ^ "Microsoft Word – KirkReportfinal.docx" (PDF). Archived from the original (PDF) on 17 November 2011. Retrieved 17 December 2011. ^ "Somalia: Puntland President Speech at Constitutional Conference in Garowe". Retrieved 20 May 2016. ^ "SomaliaReport: Puntland Government Delivers Food and Water". Archived from the original on 22 March 2016. Retrieved 20 May 2016. ^ a b Gettleman, Jeffrey (1 September 2010). "In Somali Civil War, Both Sides Embrace Pirates". Nytimes.com. Retrieved 27 March 2011. ^ Haji, Mustafa (2 May 2010). "Somali Islamists vow to end piracy, pirates flee with ships". Archived from the original on 23 February 2014. Retrieved 27 March 2011. ^ Ng, Eileen (15 July 2010). "World pirate attacks drop 18%". News.smh.com.au. Retrieved 27 March 2011. ^ "Somalia: Puntland forces arrest wanted pirates in Garowe". Garoweonline.com. 18 May 2010. Archived from the original on 21 May 2010. Retrieved 27 March 2011. ^ Ferguson, Jane (20 April 2011). "Life inside Somaliland's pirate prison". CNN. Archived from the original on 20 May 2011. Retrieved 2 August 2011. ^ "Somaliland coast guard tries to prevent piracy". Marine Corps. Archived from the original on 13 May 2013. ^ "Yemen court sentences six Somali pirates to death". Reuters. 18 May 2010. ^ "Trial of alleged Somali pirates opens in Netherlands". BBC. 25 June 2010. Retrieved 26 May 2010. ^ Foy, Henry (17 June 2010). "Somali pirates jailed by Dutch court". The Guardian. London. ^ Thomas, Annie (17 November 2011). "Homesick Somali 'pirates' on trial in Paris". Google News. New York. Archived from the original on 23 February 2014. ^ Connolly, Kate (22 November 2010). "Somali 'pirates' go on trial in Hamburg". The Guardian. London. ^ Crippa, Matteo (2 December 2012). "UPDATE: Convictions in First Italy Piracy Trial". Piracy-law.com. Retrieved 25 December 2012. ^ Crippa, Matteo (27 March 2012). "Historic Piracy Trial Opens in Italy". Piracy-law.com. Retrieved 25 December 2012. ^ Nelson, Katie (1 April 2010). "U.S. Navy captures 5 Somali pirates; seizes pirate mother ship off Kenya, Somali coasts". New York Daily News. Retrieved 1 April 2010. ^ McGlone, Tim (8 November 2010). "Federal judges in Norfolk wrestle over definition of piracy | HamptonRoads.com | PilotOnline.com". HamptonRoads.com. Retrieved 27 March 2011. ^ McGlone, Tim (15 March 2010). "5 Somali pirates get life for attack on Nicholas". HamptonRoads.com. Retrieved 27 March 2011. ^ Reilly, Corinne (3 November 2010). "Arabian Sea piracy suspects appear in Norfolk court". HamptonRoads.com. Retrieved 27 March 2011. ^ "U.S. Court Upholds Somali Pirates' Conviction". New York Times. 23 May 2012. ^ Hayley O'Keeffe (15 October 2013). "Somali Pirate Kingpin Abdi Hassan Arrested in Belgium". London: Daily Mail. Retrieved 5 November 2013. ^ James Bridger (4 November 2013). "The Rise and Fall of Somalia's Pirate King". Foreign Policy. Retrieved 5 November 2013. ^ "Ship manned by Egyptians seized by Eritrean forces not pirates". Reuters. 20 January 2014. Retrieved 20 January 2014. ^ "Pirates hijack oil tanker off Somalia's coast". 14 March 2017. Retrieved 20 June 2018. ^ "Somali pirates release oil tanker and crew after first hijack for five years". 16 March 2017. Retrieved 20 June 2018.